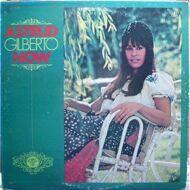 Two years after her underrated album on CTI Records, Astrud Gilberto's follow-up is her first attempt to be taken seriously, not as a singer -- she had that covered -- but as a songwriter, at a time when simply singing standards was seen as lacking. Her four songs on this ten-song album show she has a way with a melody, though obviously influenced by countrymen Milton Nascimento and Jorge Ben, and her producer Eumir Deodato. "Gingele" and "Zigy Zigy Za" are exactly the kind of riff-based tropicalismo that Ben and company were making popular around this time.